Bedford is an award-winning Australian author, and this is his third novel for Calgary publisher, Brian Hades (Edge SF). 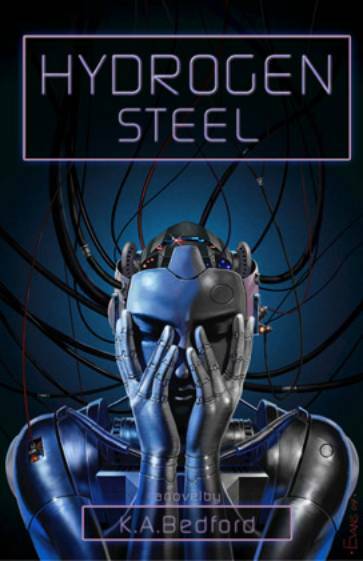 If you’re wondering, as I did, why an Australian has to send his novels to Canada to get published, it may be because Hydrogen Steel has something of a Canadian outlook. Zette McGee is a hard-boiled police detective who comes out of retirement when an alleged murderer appeals to her for help. Zette takes the case because the suspect knows more about Zette’s own past than she does herself, and with the help of fellow retiree Gideon, they spend the next 350 pages chasing clues and avoiding escalating assassination attempts to stop them from uncovering the truth. That’s not the Canadian part, though. Bedford has created an engaging mystery that keeps the reader turning pages, set against a future filled, packed – crowded, really – with futuristic tech: nano, renegade AIs, replicants with identity crises, wormhole space travel, alien monitors (mostly offstage), skyhooks, terraforming, and brain upgrades — the lot. Aging SF readers like myself might find it all a little too familiar and superficial, but younger readers are likely to be blown away by this rapid-fire assault of the next ‘big idea.’ And to his credit, Bedford manages to avoid the worst excesses of expository lump, only occasionally pausing the story to explain this or that technology, or having the characters work through the implications of some technology that, really, must have been familiar to citizens living with these systems. Bedford’s hero’s frequent whinging over the meaning of life in a replicant world is only mildly distracting from the quite taunt mystery, and such philosophizing will likely fire the imagination of its intended younger audience. I may prefer the deeper, subtler analysis presented in Karl Schroeder’s Lady of Mazes or the intricate economics of Schroeder’s Permanence to the hodgepodge of ideas thrown together in Bedford’s novels, but it all works well enough as a backdrop to Hydrogen Steel’s ‘buddy movie’ mystery. Okay, still not particularly Canadian. Up to this point, no reason this could not have been published in the United States, or Australia. What distinguishes Bedford’s novel from the dozens of others of its ilk is the very Canadian ending: When our heroes finally solve the murder and uncover the awful truth – nobody much cares. Turns out, all that death and destruction and sacrifice were pretty much irrelevant. Now that is an ending that isn’t going to sell to the American mass market anytime soon. You can sell a conspiracy novel in the States, no problem; you can even have the conspirators win (did I mention that pretty much everyone on our side is dead by the end of the book?) — but you cannot have the hero and her team struggle for 350 pages, only to be handed the solution in the last ten pages by a bystander with a, “Oh, is this what you were looking for?” shrug. American readers expect their protagonists to confront and overcome some problem through dint of their own heroic efforts – being handed the solution by someone else and discovering that it was all a huge waste of time is simply not on. I fully expect American reviewers to pan the ending, but like the editors at Edge, the novel kind of appealed to the Canadian in me. Given that our national character is defined by our identity crises and our sense that our efforts will always be overshadowed by the machinations of the overwhelming power to the South, the dominant themes of Hydrogen Steel hold a kind of resonance for us. So, all things considered, Hydrogen Steel is a decent juvenile mystery adventure, well worth a read. Originally in Neo-opsis # 12.